On September 15, Automechanika will play host to a hotly contested competition for the best vehicle sound system in Germany. This year’s show will offer amazing sound experiences ranging from discreetly integrated high-end sound systems to supercharged bass speakers for those who really love it loud. Automechanika Frankfurt will be commencing its 25th edition in just three weeks, and this year it says it is focusing more than ever before on cars that have already found its owners. Examples of this include the extensive treatment of classic cars, Reifen and the expansion of CarMediaWorld to include the German Sound Quality Finals being held in the Agora by the European Mobile Media Association (EMMA). “In our role as organiser, we collaborate closely with all the most important associations, institutions and industry players in the automotive aftermarket to ensure that we can continue developing the concept of this fair. This is true not only for Frankfurt, but also for all other Automechanika trade fairs around the world.” Braun added. The fourth CarMediaWorld at Automechanika will be featuring high fidelity sound systems, intelligent networking and digitization in vehicles. Specialists and its automotive customers will encounter a tremendous variety of audio equipment, versatile products and system solutions in as many as 70 vehicles that are intended especially for cars that are already traveling the roads. An international panel will be reviewing and evaluating the installation and sound quality of every participating vehicle as part of the German Sound Quality Finals. Whoever is crowned champion during the awards ceremony at the end of the competition will qualify for the EMMA European Championships in Salzburg in March 2019. 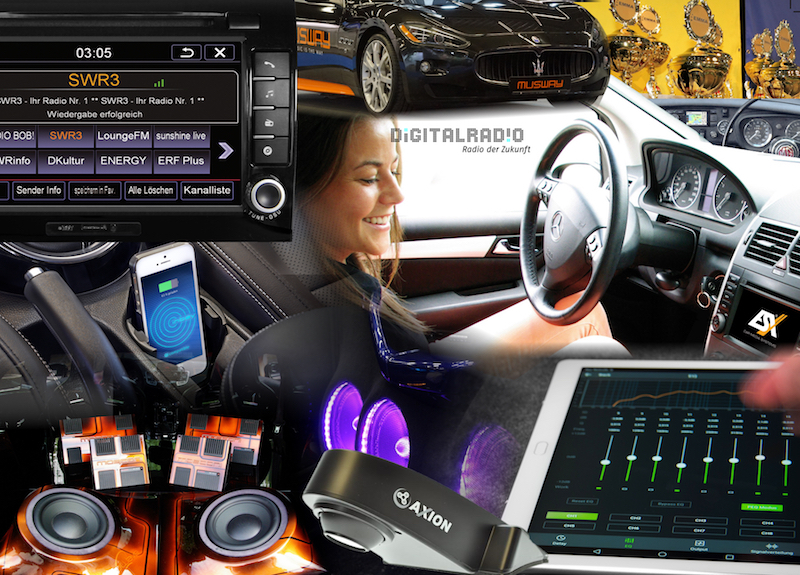 Car infotainment specialists ACV, Audio Design (with its ESX and Musway brands), Axion and Standartplast will be presenting its latest products and solutions in Hall 3.1. These include technologies for professional navigation and smartphone connections, DAB+ reception, HD audio streaming, fast and affordable tuning for ex works sound systems, inductive smartphone charging, safe manoeuvring and parking, and efficient driving. CarMediaWorld exhibitor Audio Design will be honoured at this year’s Automechanika Innovation Awards as a ‘Nominee’ for its ‘Musway M6 Amplifier with DSP’, an award that highlights the degree of innovation offered by this new product. Audio Design says that the Musway M6 delivers significantly improved audio quality ex works with little effort. The car audio and information specialist’s submission is competing against some 120 other products. “We are very proud of the fact that we’re the only company whose car audio product has been nominated. It shows that our strategy of creating modern products that satisfy the demand for an audiophile music experience in cars is the right one. The components in our Musway range combine state-of-the-art technology with the ultimate in efficiency – not only for installation time and space requirements, but also when it comes to configuration,” says Audio Design’s Founder and Managing Director Bruno Dammert. The German Sound Quality Finals are taking place on September 15 in the Agora starting at 09:00.